We think the Warner Brothers VIP Tour is the best genuine studio tour you can do. There are no roller-coasters or 3D screens, just the opportunity to go behind-the-scenes at a genuine working movie studio. There’s loads to see but we found the most impressive thing of all is the chance to see the “back lots” where wooden fake streets are adapted for each movie scene they want to shoot there. When we visited, one back-lot street was being converted for the next movie which was fascinating to see. 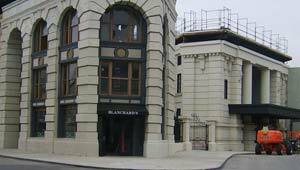 On the tour, you get driven around on a little buggy from place to place and occasionally it stops to allow you to see areas like the sets of films being shot at the moment, the scenery departments, the set for ER and even a little collection of movie vehicles like the “Batmobile” and the Harry Potter Ford Anglia. Our tour was made extra special by the guide who was fantastic and and knew every inch of the studio areas and how they’d been used in movies over the years. We thought the whole thing was a real insight into movie making. You might be shocked at the tour price, but we felt it was well worth it. When we took the tour, a souvenir photo was also included in the price, plus you can take photos (unless restricted) on the tour from the carts you travel in. The VIP Tour operates on weekdays only – follow the signs for “VIP Tour” from Warner Boulevard. It costs $49 per adult (2012 price) and last around 2 and half hours. You may need to take your passport with you for security. You can buy tickets in advance in UK pounds here.